The WordPress configuration file, also known as wp-config.php, is most frequently used to set up a database connection and is then forgotten. Despite its neglected nature, it is a powerhouse of features and opportunities for optimization. While you don’t typically use the config file on a day-to-day basis, I’m betting that almost every WordPress install could benefit from adding a couple of things to this file. A well thought out config file can not only make a website faster and more secure, it can also add features like the ability to empty the trash more frequently, or disabling features such as revisions and offer advanced debugging capabilities. In this article we’ll look at the default settings that ship with your config file and how you can tweak it to better suit the needs of your WordPress website. What is the wp-config.php File? According to the WordPress Codex, the config file is One of the most important files in your WordPress installation. It file is located in your WordPress root directory and contains important information such as database connection data (username, password, etc.) and various settings. wp-config.php is actually not a part of the files that ship with WordPress. If you download the WordPress software you won’t find this file anywhere. Instead, you’ll find wp-config-sample.php. When you install WordPress you can rename this file to wp-config.php to set up your environment, or WordPress will create a final config file based on the information you give it during installation. You can take a look at the default content of your config file by checking out this sample at GitHub. This is the same wp-config-sample.php file you get in your own installations. The file is extremely well documented and I’ll explain some of the settings here nonetheless. Many settings in the config file use PHP constants. As the PHP documentation states, a constant is an identifier for a simple value. The value can not be changed for the duration of the script. The general format of a constant is define( 'CONSTANT_NAME', 'CONSTANT VALUE' ). So let’s go through what all the code in the wp-config.php means. The first six settings are all about the database connection. WordPress stores posts and various other bits and pieces of data in a database; it needs access to said database to function. A database connection typically requires a host, a username, a password and a database name. The code above shows the constants without the inline documentation. The first four lines define the four settings I talked about previously. The charset and collation both have to do with languages and how specific characters are stored. UTF8 is a good choice because it contains special characters like “ő” for example. Collation determines how strings are compared in the database. Some collations may be case sensitive, others may be case sensitive for example. Unless you specifically know about these things it is best to leave these two settings alone. The next eight settings are all used for securing WordPress. Authentication keys are used as security checks while salts are used when hashing passwords. You can fill these out yourself but there really is no need. You can use the secret key generation utility to create these constants very quickly. I highly recommend reading Why WordPress Authentication Unique Keys and Salts Are Important – it is a great read. As the article mentions, changing your keys and salts now and again is not a bad practice. Why not set a reminder every 90 days or so? There are two more settings in there, the table prefix and the debug setting. The table prefix tells WordPress what prefix your database tables use. The default is wp_, which would mean that your posts table is named wp_posts. One of the best ways to protect against attacks is to be unpredictable. It is a good idea to use default settings as little as possible, especially when they pertain to something as crucial as your database. If you’re just installing WordPress it’s a good idea to use an obscure prefix such as Jbh8h3dD_oj3e_. WordPress won’t mind that this is a lot more complex; to a script there is very little difference between wp_postmeta and Jbh8h3dD_oj3e_postmeta. The config file is just like any other file, which means you can add any valid PHP to it. That being said, you should take care when editing wp-config.php. Only add to it when absolutely necessary and take care when editing because any incorrect edits you make could cause your website to stop functioning. After all, this is the heart of WordPress we’re tinkering with! It’s a good idea to refer to the wp-config documentation in the WordPress Codex for all the official tweaks you can make to this file. All the additions I’ll be mentioning in this article are safe to use if pasted correctly, but please be aware of what each of them does. There are some edits that you can make which have a place in the config file but are not a part of the documentation. One good example of this is the API access key and secret for your Amazon S3 server when using the Amazon S3 and Cloudfront plugin. You could also use it to store your Google Fonts or Google Maps API key and other similar things. Do keep in mind though that this method is not for every single bit of data around. If you’re creating a plugin where the user needs to enter his/her address it should be stored in the database. There are two settings you can set in the config file which control WordPress URLs. One is the WP_HOME constant and the other is the WP_SITEURL constant. There is always some confusion about these, so let’s clear things up. Both settings can be controlled from the WordPress settings section in the admin. The first setting in the screenshot, the WordPress address, corresponds to WP_SITEURL.The second setting, site address, corresponds to WP_HOME. When you use the config file to define these URLs, the settings given in the admin are overwritten and the config file takes precedence. The WordPress address, or WP_SITEURL, is the URL that users enter to visit your website. The site address or WP_HOME should point to the root of your WordPress install, which could be in a sub-directory. To learn more about the use and issues with these URLs I suggest reading Using WP_SITEURL and WP_HOME to migrate a WordPress site. Note that different folders behave slightly differently. The wp-content folder requires an absolute path and a full URI to be given. The plugins directory is much the same, but for compatibility issues you may want to use the PLUGINDIR constant as well. Themes and uploads are a bit different. The default theme directory is hardcoded into WordPress, it is always set to the directory named themes inside the content directory. You can, however, add additional theme directories. In the code above I created a theme directory in the root folder. The uploads directory is always relative to the ABSPATH directory, which would be your root directory. In this case I have placed the directory in the root folder. There is a special kind of plugin folder not many people know of called mu-plugins, short for “Must-use Plugins.” These plugins are loaded by default before any other plugins. To learn more about them ready the Must Use Plugins documentation in the Codex. If you like the idea but want to change the location you can do so in a similar fashion to how we changed the plugin directory above. The default theme in WordPress is the most recent twenty-something theme. In WordPress 4.0 this would be Twenty Fourteen. If you would like a different fallback theme you can change the WP_DEFAULT_THEME to the folder name of your preferred theme. If you must change this I advise choosing a simple but very well-coded theme. If something goes wrong and your site’s theme is missing it will revert back to the default theme. WordPress has the ability to use a different table name for the users and usermeta tables. Using a custom table name could give you some additional protection although it is highly probably that if someone has access to your database they will figure this one out. Before you make the change be sure to read up on changing user tables to make the transition as smooth as possible. I’m betting that many WordPress users don’t use the post revisions feature. Even though it has been around since WordPress 2.6 it’s use is relegated to niche corners of the web. Luckily, WordPress allows you to limit or disable revisions easily using the WP_POST_REVISIONS constant. Note that you should only use one or the other, I’ve just placed both in one example for easy reference. The use of autosaves are more widespread but these may happen a bit more frequently than you need them to. By default WordPress saves your post every 60 seconds. If you create content by copy-pasting it, or you’re not worried about loosing a minute’s worth of work you could increase the autosave time. The trash is another source of clutter which can be controlled easily. By setting the EMPTY_TRASH_DAYS constant you can control how many days a post stays in trash before it is completely deleted. You may also set this to 0 to disable the trash altogether. Multisite allows you to create separate sites based on the same WordPress install. This allows you to manage a multitude of sites very easily. Multisite is commonly used for corporate websites where the shop, blog and company site may be separate. It could also be used to host websites for a community of bloggers. Developers use it to host multiple themes and plugins. Once defined, reload the WordPress admin and you should see a “Network Setup” option in the “Tools” section. Follow the instructions outlined there. WordPress will ask you to add additional settings to your config file as well as your .htaccess file. Once done you should be logged out and when you log back in you’ll have a nice new network install. Refer to the Create A Network page for a more complete setup guide. A setting related to Multisite installs allow you to redirect users when someone accesses a sub-site, which does not exist. The NOBLOGREDIRECT constant defines the URL users are directed to in these cases. Especially when working with Multisite installations you may want to make sure that plugins and themes cannot be edited using the built-in file editor, you may even want to make sure users can’t install their own plugins and themes. This can be achieved with the DISALLOW_FILE_EDIT and DISALLOW_FILE_MODS constant. Note that if you define DISALLOW_FILE_MODS as true you don’t need to define DISALLOW_FILE_EDIT since this will be disabled as well. The config file has a number of settings which help developers catch errors or write better code. The most prominent of these is the WP_DEBUG constant, which we’ve already look at. Defining this as “True” will force errors to be displayed. By default, scripts are concatenated and minified. Concatenation is the process of joining files. 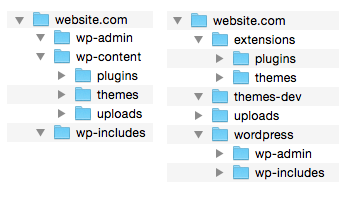 Instead of loading 20 scripts individually WordPress concatenates them into one file and loads that. Minification is the process of compressing a file into a format which is non human-readable but computers work just fine with it. These two methods save considerable loading time and server resources. When enabled the errors encountered will be logged to a file named error.log in the wp-content folder. Once defined we can print the content of $wpdb->queries to get an overview of all the queries. If you’re feeling particularly fancy or you need to look at these queries all the time you can hook this into wp_footer to make sure they are always displayed at the end of each page. In some rare cases you may need to manually allot more memory to WordPress. While I have encountered situations where PHP ran out of memory while running WordPress, these were all caused by wasteful themes or plugins. If you need to you can set the memory limit with the WP_MEMORY_LIMIT constant and the WP_MAX_MEMORY_LIMIT constant, which controls the amount of memory available for the admin. Cron is a time-based job scheduler in Unix-like environments. WordPress has a cron feature, which is not a real cron but copies its features closely. WordPress cronjobs run at regular intervals and perform various tasks. For example, the cron system is responsible for publishing posts at the correct time. The drawback of the system is that it relies on site visitors to perform cronjobs so the task may not run at the exact given time. If you set a real cron on your server to run at 1am every night it will do so with extreme precision. WordPress crons are triggered by visitors loading the site. This means that if you use WP cron to initiate an action at 1am it will be run the first time the website is loaded after that time. If you don’t have any visitors until 11am, the task will be completed then. In most cases this is not a problem. If you’ve set a post to be published at 1am and noone visits the site until 11am the post will be published before the site loads for the user, for all intents and purposes, the post was published on time. The config file also allows you to disable the cron altogether and to limit the repeat interval between the same cronjob. When WordPress is updated it may run a dbDelta() function, the purpose of which is to modify your database to conform to the latest specifications. This usually poses no threat at all but for sites with huge tables (especially username tables) this may take a while to complete. There are two options in the wp-config.php file which allow you to use SSL. FORCE_SSL_LOGIN makes sure that logins always use SSL, but the admin sessions themselves don’t. This adds some protection while making sure SSL doesn’t slow down the admin process. FORCE_SSL_ADMIN supersedes FORCE_SSL_LOGIN, so if you’re using the more secure option there’s no need to define FORCE_SSL_LOGIN. Depending on your server setup there may be a bit more you need to do to access your site via SSL. I suggest reading the excellent Administration Over SSL guide in the Codex. I personally enjoy automatic updates because they make my website safer and ensure I’m always running the latest version of WordPress. Being always up-to-date is a good thing and there are very few legitimate cases where not updating is a good idea. Modifying WordPress core files, a downloaded theme or plugin is never one of them. If you need to disable updates for any reason, WordPress gives you two constants to do so. AUTOMATIC_UPDATER_DISABLED can disable all automatic updates in one go. A better way to do this is to use the WP_AUTO_UPDATE_CORE constant. As you can see, the WordPress configuration file offers plenty of opportunities to tweak your site and make it your own. From modifying directory locations to logging in via SSL, a lot is possible. What are your favourite wp-config.php tricks, did I miss anything or do you use something which isn’t official but works great? Let us know in the comments below. Well done ! This is the more complete and clean guide on this subject ! Yep, there is a few more but I didn’t want to go into the Cache, FTP and especially CHMOD ones. CHMOD can cause a lot more harm than good and I didn’t want people to get sidetracked with file permission issues. is ESPECIALLY dangerous since it provides read-write access globally, I would not recommend it. How would one go about custom directories with a multisite setup (Subdomain or Subdirectory)? I haven’t done this myself and I didn’t do any research before this answer but I think the answer should be: “there’s no difference”. WordPress stores all themes in the wp-content/themes and all plugins in the wp-content/plugins directories, regardless of your setup (single/multisite). Since these are always stored like this I imagine that if you move them with the methods above they will work just fine. It will works but there are some limitations (and they are mentioned on Codex). You cannot choose Sub-domain Install (for a domain-based network) if the WordPress URL contains a path, not just a domain (that is, WordPress is not installed in a document root, or you are not using the URL of that document root). Very great read, thanks Dan. Question… any idea why register_theme_directory( dirname( __FILE__ ) . ‘/themes-dev’ ); is giving me a blank site on localdev? I noticed the __FILE__ has spaces around it and the other don’t so I tried it without the space and the site still goes blank. I found how to register this as a function but still the same outcome. The only codex I could find on it was to use this to register a plugins theme folder and not the WordPress theme directory. I used the same code with /templates as the directory. I suggest setting WP_DEBUG to true, this will help you troubleshoot, since you may have errors. Spaces within the function should have no consequence, my first instinct is that you have a hard-to-catch syntax error like a mistyped function name.